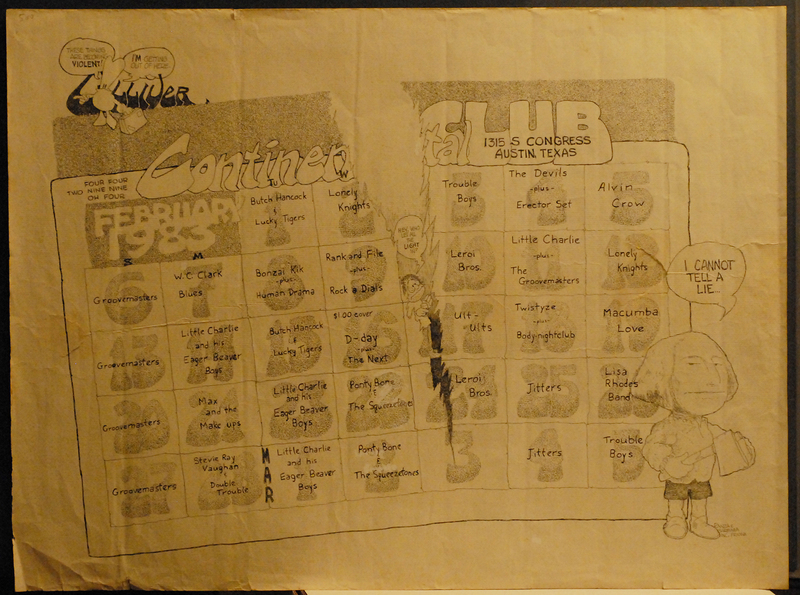 Continental Club, Austin Texas, February 1983, original B & W artwork for a monthlly calendar flyer for this legendary Austin music club. Artists featured that month include Stevie Ray Vaughan & Double Trouble, Butch Hancock, Leroi Brothers, bluesman W.C. Clark, and others. Artwork is 18" x 24" black india ink on art paper, all hand lettered with some cartoon drawing including one of George Washington(!). Artist's credit is "Ranza and Barbara Inc. In Friona." For an illustration, click here. This is a rather remarkable item from the heyday of the Austin club scene, featuring its most famous bar band player (Stevie Ray Vaughn) in one of the most legendary clubs in a town full of them. Asking $500 for this item; truly one of a kind. 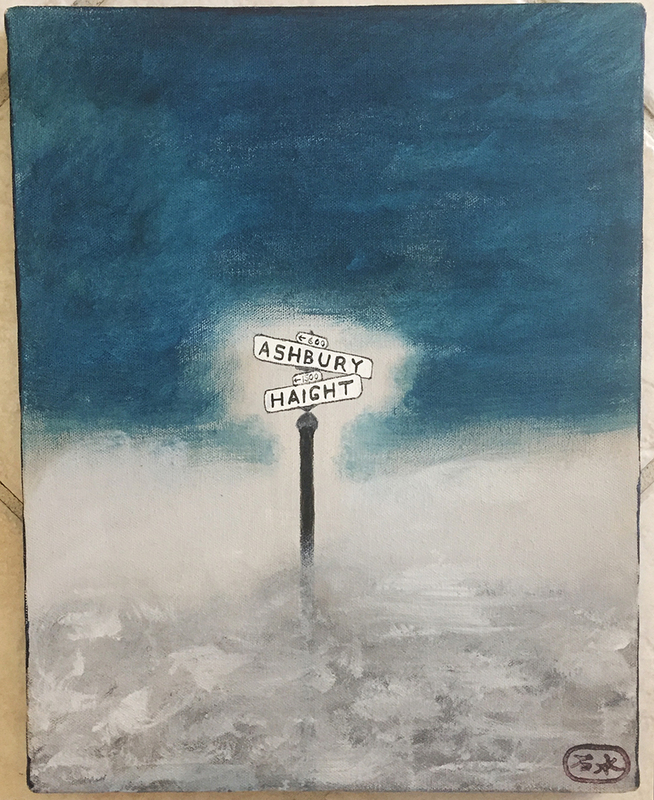 "Foggy Haight," 1992 original11 x 14" color oil painting on canvas showing the famous Haight & Ashbury street sign shrouded in fog. Not usually the kind of thing I run on this list but found this at a local Marin County estate sale and couldn't resist it! For an illustration, click here. 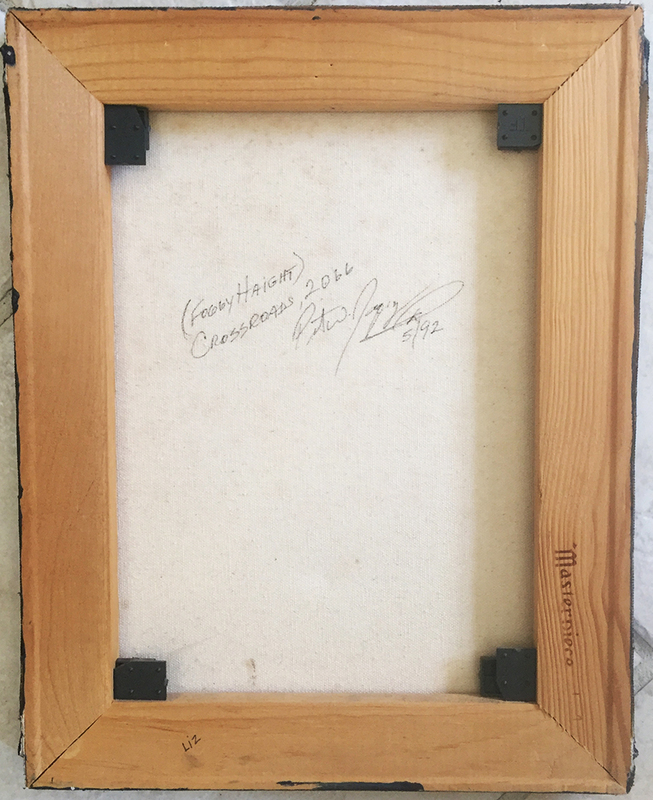 Reverse has signature, date, and title by the artist. 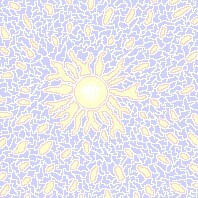 For an illustration of the reverse, click here. Great item to go on your wall next to some vintage SF rock posters. $ 55.00. Neil Young, Jerry Garcia & Friends (Grateful Dead), Doobie Brothers, Jefferson Starship, The Miracles, Tower of Power, Santana, Joan Baez, Mimi Farina, Graham Central Station, others, 3/12/1975, Kezar Stadium, San Francisco, CA; SF SNACK benefit to raise money for school programs; design with Randy Tuten with center collage image featuring Golden Gate Bridge, for image, see The Art of Rock, pl. 4.49, This is a SET OF SEVEN PROGRESSIVE PROOFS: one full color sheet of 1 poster and 10 cards, and six other various color combinations beginning with single color black, pink, and brown sheets and adding colors in other combinations. Each sheet is hand signed by artist Randy Tuten. Very nice set of progressives, NM-, clean but with a bit of minor storage age, $595. Grateful Dead, Jefferson Starship, Boz Scaggs, Country Joe McDonald, 5/28/1982, Moscone Center, San Francisco, California; benefit for Vietnam Veterans project; image by Randy Tuten with purple background, pink lettering, top image of a globe with the country of Vietnam on it and a red rose over the top; beautiful design, one of Tuten's nicer 80s vintage posters. This is a SET OF FOUR PROGRESSIVE PROOFS: one full color 18 x 24 uncut sheet of two posters, and three sheets of partial printings, one black and white and the other two with various color layers added. Nice little set; NM- clean but with a bit of minor storage age. $350.